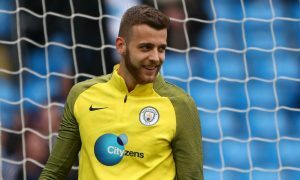 Manchester City goalkeeper Angus Gunn continues to impress on loan at Championship side Norwich City and that has led to significant interest in him for next season. According to journalist Alan Nixon, the 22-year-old England under-21 international is wanted by Premier League side Stoke City and Scottish giants Celtic to be their first-choice goalkeeper next season. Paul Lambert’s Stoke scouts are watching Angus in case Jack Butland moves on, with Liverpool heavily linked with a move for the England shot-stopper. The Potters would either try to take Gunn on loan for the season or buy him outright. Celtic boss Brendan Rodgers is also keen with Craig Gordon struggling with injuries, and could try to tempt Gunn with the promise of Champions League football next season. The Hoops would try to loan Gunn rather than buy him, something City may be inclined to agree to if they don’t want to cash in on the promising goalkeeper at this stage. Meanwhile, Scotland manager Alex McLeish, who is close friends with his dad Bryan Gunn, a former Scotland international, may try to change Angus’ mind about which country he represents, with the player eligible for England and Scotland. McLeish will pursue talks with Gunn and with several English goalkeepers in front of him, could promise the Manchester City starlet some senior international caps quickly in an effort to lure him to the Tartan Army.